Last weekend, I found myself in the parks during the early afternoon, and I realized that I should head over to Frontierland to get some shots of Big Thunder Mountain Railroad in direct daylight. It's funny to me, but with all the photos I've taken at the park, I lack pictures of this ride in the sun. Usually, I get to the park a little too late, and the mature trees to the west have shaded the most scenic parts. And even if the sun is nowhere near setting, those trees have already shrouded the ride in a less saturated light. For that reason, I love the bright and festive feel of this shot, with all the different colors coming together in a delightfully lively manner. The dynamicism of the train hurtling by doesn't hurt either. 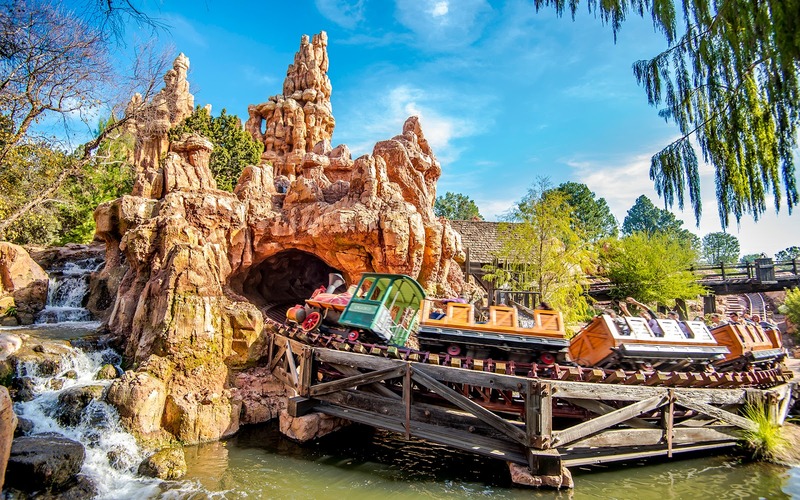 It certainly is a beautiful wildest ride in the wilderness! A Big Thunder Mountain Railroad train hurtles around the climactic turnaround after its third drop.